Over thousands of years sailors have learnt to estimate the speed of the wind just by looking about. 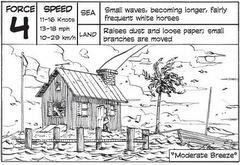 This technique matured into what we now call the Beaufort scale. The universe tells you everything you need to know about it as long as you are prepared to watch, to listen, to smell, in short to observe. The bow — any bow — is basically a spring. The archer does work on this spring as he draws the bow, storing potential energy in the elastically deformed bowstave. When he releases the string, some of this potential energy is converted into kinetic energy of the arrow, through the action of the tension in the bowstring accelerating the arrow, the arrow leaves the bow at high speed and wings its way towards its target. Its orientation is stabilised by three fletchings at the rear of the arrow. 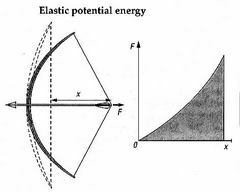 If we draw a graph of the force F needed to draw the arrow back through a distance x, the area under the graph represents the work done on the system and hence the potential energy stored in the bow. If the graph is a straight line through the origin (i.e. the bow behaves like a spring that obeys Hooke’s law), this energy will be equal to Fx/2 (see diagram). In fact, the graph of F against x is usually a curve, because of the complicated shape of the bowstave (it is thicker in the middle and thinner at the ends) and the fact that the tension in the bowstring does not always pull in the same direction relative to the ends of the bow. We deal with this by introducing an efficiency term e, and writing the total energy stored as eFx/2. 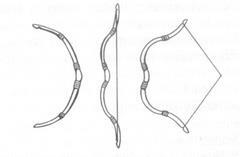 While a modern bow made of composite materials can have an efficiency greater than 1, a medieval longbow would have had an efficiency of about 0.9. 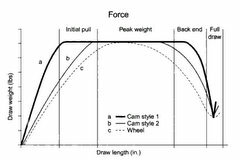 So the goal is to maximize the potential energy stored in the bow, which is represented by the area under the curve, but the bow, since it behaves like a simple spring, offers next to no resistance at the beginning of the pull. A hefty longbow with a 100-pound draw does not have a constant 100-pound draw; it culminates with 100 pounds of resistance near the end of the pull. What we want is something closer to constant resistance, so that with the same peak resistance we can store twice as much energy — because the area under the curve is now a rectangle, not a triangle. This is what composite, recurve bows do — or almost do. By mixing materials — traditional compound bows are made of wood, horn, and sinew, not just wood — and adding additional curves, these bows provide more resistance earlier in the pull. Modern bows take all this a step further, by using pulleys with specialized cams to not only even out the resistance but to drop it off dramatically at the very end of the pull, so they can easily be held “loaded” and ready to shoot — which is not practical with a historic longbow. Imagine that you are a researcher in a hospital who is studying the effectiveness of a new treatment for a generally terminal disease. The major variable of interest is the number of days that the respective patients survive. In principle, one could use the standard parametric and nonparametric statistics for describing the average survival, and for comparing the new treatment with traditional methods (see Basic Statistics and Nonparametrics and Distribution Fitting). However, at the end of the study there will be patients who survived over the entire study period, in particular among those patients who entered the hospital (and the research project) late in the study; there will be other patients with whom we will have lost contact. Surely, one would not want to exclude all of those patients from the study by declaring them to be missing data (since most of them are “survivors” and, therefore, they reflect on the success of the new treatment method). Those observations, which contain only partial information are called censored observations (e.g., “patient A survived at least 4 months before he moved away and we lost contact;” the term censoring was first used by Hald, 1949). In general, censored observations arise whenever the dependent variable of interest represents the time to a terminal event, and the duration of the study is limited in time. Censored observations may occur in a number of different areas of research. For example, in the social sciences we may study the “survival” of marriages, high school drop-out rates (time to drop-out), turnover in organizations, etc. In each case, by the end of the study period, some subjects will still be married, will not have dropped out, or are still working at the same company; thus, those subjects represent censored observations. In economics we may study the “survival” of new businesses or the “survival” times of products such as automobiles. In quality control research, it is common practice to study the “survival” of parts under stress (failure time analysis). 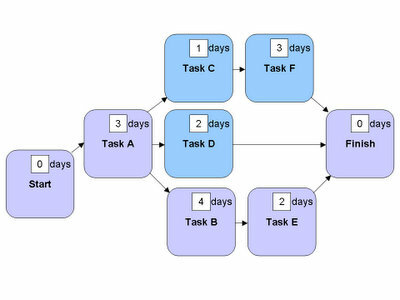 It has been a while since I last discussed Eli Goldratt’s Critical Chain and project management, but there is one more element to Critical Chain Project Management that I haven’t touched on. 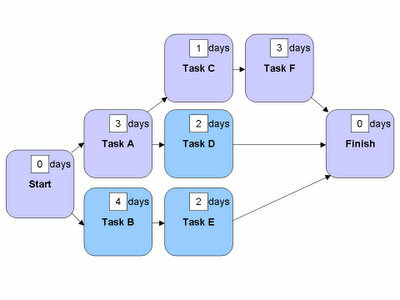 Critical-path analysis assumes that a task is either dependent on another, or it’s not. But what if two tasks require the same limited resource? What if they require the same expert’s time, or the same expensive piece of machinery? 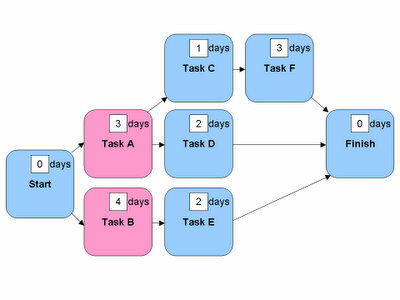 The two tasks aren’t dependent on one another, but they can’t be performed in parallel. Suddenly our wonderful critical-path analysis goes out the window, and we have to tinker with the schedule until our resource isn’t in two places at once. With a toy problem, this is easy enough to do by inspection. With a larger program, let a computer do the work. Of course, if you don’t have this all plotted out ahead of time, you find out the hard way that Task B is wildly behind schedule, and that your critical path has shifted from Tasks C and F to Tasks B and E.
The kamikaze pilots didn’t come along till so late in the war that everything was in short supply. The planes they had were junkers, the fuel was usually “A-Go” ersatz that would blow up if you didn’t keep your eyes on the dials every second, and recon was a joke. Just finding the target was iffy, as Nagatsuka and his squadron found out. And the lucky suicide boy who got to his target still had a lot to worry about, like hitting a ship, a moving target that was guarded by technologically superior U.S. fighters, hidden by battlesmoke and in the middle of a hedge of AA fire. Nagatsuka says the U.S. gunners invented a new tactic for beating “wave-hopping,” low-level kamikaze attacks: “The enemy…explode shells all around their own ships so as to create a screen of waterspouts….” Kamikazes had two options: high-angle dive (which meant facing the fighters) or wave-hopping (which meant AA and waterspouts). Like most last-ditch suicide techniques, the kamikazes had their biggest successes while the element of surprise was with them. There’s a nice little table at the back of the book showing the steady dive in effectiveness, from an October 1944 attack where 18 kamikazes damaged 7 carriers to the August 1945 attacks that had pitiful results: 59 kamikazes died (meaning 59 planes lost too), and only managed to damage three US ships, small-timers at that (1 destroyer, 1 transport, 1 seaplane carrier). Nagatsuka was young enough to be in on this last stage of the war, the almost pitiful end of Imperial Japan. That’s why he lived to write the book: everything went wrong, and the Empire couldn’t even mount decent suicide raids. You could say that Imperial Japan wasn’t big on excuses in general. If a mission failed, you were supposed to make your apologies with a seppuku knife, like General Saito did after the Saipan landings. My favourite ritual suicide in this book is Rear Admiral Inokuchi’s. As his battleship, the Musashi, is sinking from American fire, he actually goes to the trouble of slashing his belly open, instead of just waiting to drown. So he goes down with the ship sashimi-style. That’s the thing about the Imperial military elite: they thought way too hard about arranging the perfect death for themselves and not nearly enough about arranging a quick and nasty death for the enemy. There are times, especially in irregular warfare, where Patton’s line about “making the other poor SOB die for HIS country” doesn’t apply, but it really does apply to WW II in the Pacific, and Tojo’s boys should have had it tattoo’d on their foreheads. They were so obsessed with making the perfect death-scene that they even expected us Americans to be “impressed” with their mass suicide. That’s exactly what Nagatsuka says about the thousands of Japanese civvies who walked into the ocean or jumped off cliffs after Saipan fell: “The Americans…should have been moved by the terrifying and yet dignified spectacle of death….” Well, uh, no, Mister Nagatsuka. The Americans thought you were sick freaks. Some things don’t translate as well as Top Ramen. The pilots had a good net value; the infantry didn’t. Nagatsuka talks about how crummy suicide was for the “foot sloggers” who died on Saipan, because with a grenade the most they could hope to do was take one or two enemy with them. Even Sgt. Nonaka died cheap, trading the enemy one for one. But the kamikaze who took out an aircraft carrier was making a very smart bargain, and you can see the Cadets in Nagatsuka’s unit thinking this through, even if they have to talk about it in the fancy (sometimes downright campy) language of Imperial Japan. Nagatsuka puts it bluntly: “One plane against one ship, that was the basic principle.” It works because one fighter is always going to be much cheaper than one carrier. He was given nothing but small planes and ships-fishing boats, patrol boats, that kind of thing. He kept them circling around the edges of the Persian Gulf aimlessly, driving the Navy crazy trying to keep track of them. When the Admirals finally lost patience and ordered all planes and ships to leave, van Ripen had them all attack at once. And they sank two-thirds of the US fleet. A few years ago, a US submarine commander said, “There are two kinds of ship in the US Navy: subs and targets.” The fact that big surface ships are dinosaurs is something that’s gotten clearer every decade since 1921. The signs have been there all along. In the Falklands War, the Argentine Air Force, which ain’t exactly the A Team, managed to shred the British fleet, coming in low and fast to launch the Exocets. And they did all this hundreds of miles off their coast, with no land-based systems to help. If the Argentines could do that with 1980 technology, think what the Chinese, Iranians or North Koreans could do in 2003 against a city-size floating target like a US carrier. Brain-eating amoeba blamed for 6 deaths in U.S. According to the CDC, the amoeba called Naegleria fowleri (nuh-GLEER-ee-uh FOWL’-erh-eye) killed 23 people in the United States, from 1995 to 2004. This year health officials noticed a spike with six cases — three in Florida, two in Texas and one in Arizona. The CDC knows of only several hundred cases worldwide since its discovery in Australia in the 1960s. The amoeba destroys tissue as it makes its way up into the brain, where it continues the damage, “basically feeding on the brain cells,” Beach said. People who are infected tend to complain of a stiff neck, headaches and fevers. In the later stages, they’ll show signs of brain damage such as hallucinations and behavioral changes, he said. Should I expect to see a colossal brain-eating “amoeba” on the Sci-Fi Channel in the next couple months? 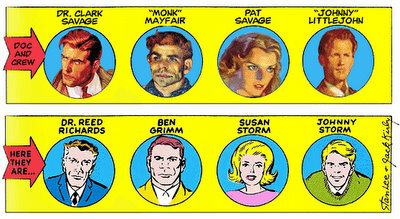 DR. REED RICHARDS is based on DR. CLARK SAVAGE aka Doc Savage. Reed is a brilliant inventor and scientist just like Doc. Reed’s habit of constantly using big words comes from Johnny Littlejohn. BEN GRIMM is based on MONK MAYFAIR. Ben is a “Thing”; Monk resembles a gorilla. Ben’s running feud with Johnny is based on Monk’s squabble with Ham. Like Renny, who was described as “thin and GRIM,” Ben also loves to slam his huge fists through doors — or anything else. 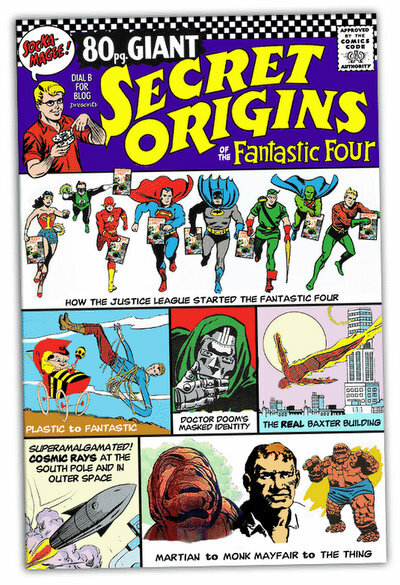 SUSAN STORM is based on PAT SAVAGE, the unofficial sixth member of Doc’s team. The beautiful and glamorous Pat is Doc’s cousin; Susan is Johnny Storm’s sister. Sometimes you do things simply because you know how to. People have known how to make ethanol since the dawn of civilisation, if not before. Take some sugary liquid. Add yeast. Wait. They have also known for a thousand years how to get that ethanol out of the formerly sugary liquid and into a more or less pure form. You heat it up, catch the vapour that emanates, and cool that vapour down until it liquefies. The result burns. And when Henry Ford was experimenting with car engines a century ago, he tried ethanol out as a fuel. But he rejected it — and for good reason. The amount of heat you get from burning a litre of ethanol is a third less than that from a litre of petrol. What is more, it absorbs water from the atmosphere. Unless it is mixed with some other fuel, such as petrol, the result is corrosion that can wreck an engine’s seals in a couple of years. So why is ethanol suddenly back in fashion? That is the question many biotechnologists in America have recently asked themselves. The obvious answer is that, being derived from plants, ethanol is “green”. The carbon dioxide produced by burning it was recently in the atmosphere. Putting that CO2 back into the air can therefore have no adverse effect on the climate. But although that is true, the real reason ethanol has become the preferred green substitute for petrol is that people know how to make it — that, and the subsidies now available to America’s maize farmers to produce the necessary feedstock. Yet such things do not stop ethanol from being a lousy fuel. To solve that, the biotechnologists argue, you need to make a better fuel that is equally green. Which is what they are trying to do. Read the article for the technical details of which molecules are under consideration. Dr Yamamoto collected the data for his own particular power-law curves by fitting his experimental subjects—about half of whom were healthy, and half of whom had been diagnosed as having clinical (or “major”) depression—with accelerometers. These devices measure how often someone changes his rate of movement by recording each time his acceleration exceeds a certain threshold. BusinessWeek asks, Will A Google Phone Change The Game? Imagine your cellphone as a mini marketing machine. As you head into your car after dinner, a text alert pops onto the screen of your handset announcing the 9 p.m. lineup at a nearby cineplex. You choose the Jodi Foster flick The Brave One and a promo video for the next Warner Bros. release, a George Clooney movie, starts running. Afterward, more text appears, prompting you to launch the phone’s Web browser so that you can click through to buy the movie’s ringtones and wallpaper. For big cell carriers, that’s the real nightmare. It’s not hard to see why. Biodiesel is 30 percent more fuel-efficient than gasoline, which in turn is 30 percent more efficient than ethanol. And while most ethanol produced in the United States comes from a single feedstock — corn — biodiesel has many sources: the oil of seed plants, such as soy and canola, french-fry grease and animal fat. That means the market can weather a price increase in any one raw material. Solazyme, a South San Francisco biotech firm, has even started making biodiesel from genetically modified algae. Better yet, biodiesel can be manufactured in large quantities today — unlike fuels such as hydrogen. Total production shot up from 25 million gallons in 2004 to 250 million last year. Nearly 100 new plants are now under construction; even Chevron has joined in, cutting the ribbon on a 20-million-gallon plant in Galveston, Texas, in May. The biggest player in the biodiesel market is Renewable Energy Group, an offshoot of a 3,000-member Iowa farm cooperative. REG accounts for 27 percent of U.S. biodiesel production and, thanks to its relationship with the soy growers, says it can increase its total capacity to 340 million gallons by the end of 2008. The company sells branded SoyPower fuel through a nationwide network of stations, some operated by grocery giant Safeway. REG should be the first biodiesel company to hit Wall Street, having filed for an IPO in July. But REG won’t be the last: Also mulling a stock offering is Seattle-based Imperium Renewables, founded three years ago by former commercial-jet pilot John Plaza. Imperium operates the largest U.S. biodiesel plant and plans to cut a production deal with Washington’s canola farmers. Take Philadelphia-based Fry-o-Diesel, founded by Yale business graduate Nadia Adawi. The startup has a patent pending on a process it developed to make fuel from trap grease, which restaurants currently pay to have hauled off. An estimated 495 million gallons of trap grease gets trashed every year. “We’re working with something that’s essentially a pollutant,” Adawi says. “But it makes a great fuel.” She is currently talking to investors and hopes to build a 3-million-gallon plant in 2008. Adawi is in good company. 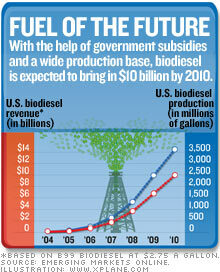 The past few months have seen plenty of major corporations rush to hop on the biodiesel bandwagon. Oil giant ConocoPhillips has inked a deal with Tyson Foods to make diesel out of animal fats. In July, U.S. Steel announced that it will use a 10 percent mix of biodiesel at its plant in Gary, Ind. And Berkeley-based Clif Bar has started subsidizing employees who drive biodiesel cars. It also benefits from the way California regulates its utilities. Their sales are separated, or “decoupled,” from revenue, so they neither earn more by selling more energy nor lose money by promoting efficiency measures that reduce those sales. Instead, California’s utilities make a guaranteed profit on all their investments — $2.8 billion this year for PG&E. The regulators have also approved big budgets for energy efficiency, something that has helped PG&E’s top business clients save money, while boosting PG&E’s bottom line. The $300 million PG&E set aside for energy efficiency in 2007 includes a lot of “customer education,” which often doubles as public relations for the company. It’s such a fine line between forward-thinking and gaming the system. When you go to fund an enterprise with outside money, you have two basic options, which you can mix and match: debt, where you have to pay your lenders spelled-out payments, or equity, where you pay your shareholders their share of profits — when you have profits. Debt is inflexible. Equity is forgiving. When you go to buy a house, you typically borrow money — you take on debt — which means you win big if your house goes up in value, and you lose big if it goes down in value. If you put 10 percent down on a $400,000 house, that means you’re putting in just $40,000 of your own money and borrowing $360,000. If the house’s value goes down 10 percent, you lose 100 percent of your initial investment — it’s worth $360,000, and you owe $360,000. If, on the other hand, it goes up 10 percent, you double your initial investment — it’s now worth $440,000, and you owe just $360,000. That’s why debt is called leverage. Now a San Francisco firm called Rex & Co. (the name stands for “real estate equity exchange”) is offering a new option, known as a Rex agreement, that can be used both to draw on a home’s equity and to hedge against declining property values. Rex gives homeowners, interest-free, a portion of their house’s market price in cash — up to 15 percent of the appraised value of the home, topping out at $300,000. In exchange, Rex gets the right to share in up to half of the future increase in the home’s value. The more homeowners are willing to let Rex cash in on future profit, the more money they get up front. If a home declines in value — and many homeowners nowadays are worried about just that — Rex shares in the loss. “It’s a way to make the equity you’ve earned more liquid,” says Rex CEO Thomas Sponholtz. A homeowner and Rex agree on how much money the property owner is to receive, as well as the percentage of the future change in the value of the home he or she is willing to share. (The homeowner also pays back the cash advance when the property is sold.) The home’s value is assessed by a third-party appraiser. The fact that they pay “up to 15 percent of the appraised value of the home,” but get the right to share in “up to half of the future increase in the home’s value” implies that they’re not just buying equity in the house though. It implies they’ve set up some kind of derivative that their customers won’t understand. 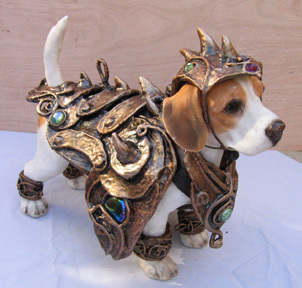 We create handmade costume pieces, jewelry and props that look like ancient metal, bone and leather. But unlike the real thing — you’ll find the pieces lightweight and comfortable. Wear them for hours through active movement — especially suited to performance. Wear it to clubs, rituals, festivals, on stage, or in the backyard! 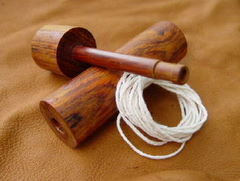 A fire piston, which in the Philippines is known as a sumpak, is a device of ancient origin which is used to kindle fire. It uses the principle of the heating of a gas (in this case air) by its rapid (adiabatic) compression to ignite a piece of tinder, which is then used to set light to kindling. You can now buy a modern polymer fire piston with O-ring seals.